New City Farm has spent 2016 tracking data for value added soup production and pizza production and we have also began preparing to offer wood fired pizza production weekly in the summer of 2017. We piloted 5 pizza nights in 2017 and compared this to weekly production of soup. We are tracking total labor hours, total produce used, total seconds produce used, total revenue and total net income. Initial data was shared with the West Michigan Growers Group on November 7 with approximately 30 farmers in attendance. New City will also present initial findings at the Small Farmers Conference in Traverse City on January 28 and the Michigan Family Farm Conference on February 4. 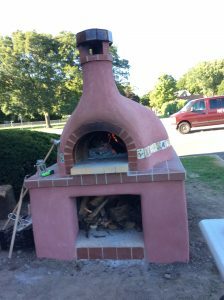 We also began research into pizza oven construction and completed our own oven September 2016. To begin our research we visited Suncrest Gardens Farm and Troy Community Farm in Wisconsin in March. We did additional research online though the website www.fornobravo.com. We then began building our own oven in July 2016 as a project through our summer youth employment program with 12 urban youth. We also led a hands on two day workshop on August 5 with 10 farmers/educators in attendance when we began building the oven core. The entire process was photographed and we will be making a U-tube video of the process in February. In 2017 we will be building an outdoor cafe for the oven with outdoor seating and a patio. We will run the cafe every Thursday from June-August. The cafe will sell pizza, soups, salads and baked goods. We will record and share this data.